Kids, this new Silversun Pickups album, Carnavas, is outstanding. Truthfully, I'm not a good enough music critic to express all the aural pleasure created by listening to this album. Full of fuzzy guitar, reverb, deep bass grooves and synth beeps and bops, combined with lead singer Brian Aubert's rasp, these songs are great from beginning to end. Carnavas is their first full-length effort and it's due out July 25th on Dangerbird Records. Picking a couple songs to feature almost seemed like an impossible task, as there really are so many good ones. They're hypnotic and create such a melodic soundscape and/or atmosphere. Some are blissful and some are hard-charging, but all come together to create a great album. 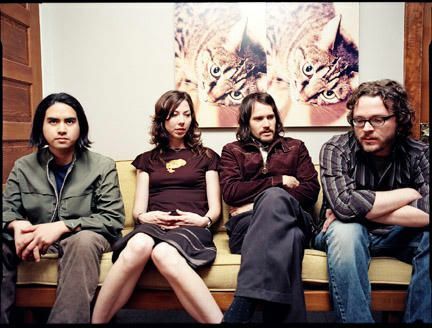 Silversun Pickups' MySpace. I saw these kids at SXSW and was impressed, but am so much more so after listening to Carnavas. They'll be playing The Vogue with Margot And The Nuclear So & Sos and Murder By Death.